Who Can I Use My Voucher With? At The HolistiCentre we have many qualified, insured and experienced Natural Health and Wellbeing practitioners accepting 'The HolistiCentre' Gift Vouchers. With a minimum spend of £5 at The HolistiCentre there is something to suit everyone. Yoga, Workshops, Meditation, Manicures, Counselling, Massages, Day Retreats and so much more is offered by our practitioners. The recipient of this voucher will find a way to experience their kind of wellness! All our Gift Vouchers come in beautiful white and gold envelopes. If you are not having the voucher devliered directly to the recipient, please let us know in your email so we can leave this envelope blank for you to write on. As soon as payment is recognised, your gift voucher will be posted 1st class to the address supplied in step one. If you wish it to be posted recorded delivery please include £1.75 extra. Step 3: Receive the voucher and share the love! 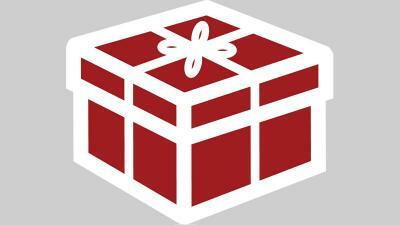 Look for the gift box symbol next to the practitioner's name to see if you can use your gift voucher with them. This will appear on each practitioner's individual page and you can get an overview of who offers gift vouchers on the Meet the Practitioners page. The HolistiCentre (THC) cannot be held responsible for lost, stolen, or damaged gift vouchers. Gift vouchers cannot be redeemed for cash and are non-refundable. If the voucher is redeemed for a future session which you do not attend, no refund will be given. THC is staffed by self employed practitioners; we do not accept responsibility for any claim arising during, or from, a session at THC with your chosen practitioner. Your chosen practitioner accepts joint responsibility, along with yourself, for how the voucher value is redeemed.